Ah, you had me fooled. I thought the other one was Stephen Fry, but then I thought that can't be right, because Stephen Fry is not a thing. William Hague, on the other hand... no doubts about him at all. Being on the other side of the pond, my first thought on this one was Dwight D. Eisenhower. I keep checking the Cabin Pressure iplayer page, hoping for a Christmas special! You should try some 'carrotcatures' which is what people would look like if they were carrots. Dept. of Hiding Light Under Bushels: even as I write I'm listening to John debating with Sue Perkins on "Dilemma". And yes, you can buy guns and ammo at WalMart in the US...just not in NY. Now I have a face to associate with the author as I continue reading Hague's biography of William Pitt the younger. Very nice. Now, how about a self caricature? Some people are easier to draw than others. In our illustration program, we came up with a word for those who possess an easily representable visage: illustraquacious. Akin to photogenic, but with drawing. Now that you say it, I see Stephen Fry. 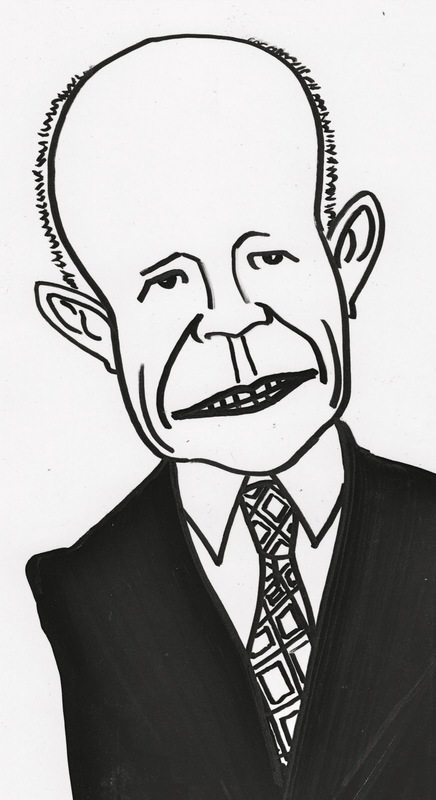 As for this one, I don't know who William Hague is, so for all I know, this could be a perfect likeness. It reminds me of Dwight Eisenhower. Still, at least it looks like a person. All my portraits tend to look like they've had some industrial accident involving acid. Emily Michelle, do you know what Google is?